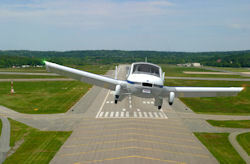 Terrafugia Transition craft is ready to fly over British Traffic. Fed up with Traffic ? Seeking new way to skip and fly over Traffic. Here is the dream come to machine. A flying car. 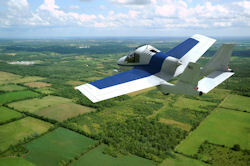 Yes, flying car retailing for £1,50,000 ($242,000) could be flying over British traffic next year. It's a two seat plane that transforms into a car at touch of a button.Many Britons are showing interest in this new trend setting machine.It can fly only 500 miles (800 km) on a single tank of fuel and can lift off from almost any long straight road. It has a top speed of 100km/h on road and 185km/h in air. It's wings fold up in 15 seconds. "This breakthrough changes the world of personal mobility", the founder of this machine Carl Dietrich said. This is the dream of aviation enthusiasts who are striving for since 1918. Not but not the least, this would be available to those with a light aircraft licence.